Hunts Point is an interesting neighborhood, as it is part residential and part industrial. Most of the food markets feeding New York City are in Hunts Point, which brings in jobs, but also brings its share of problems, such as air pollution from truck traffic, as well as noise pollution. The neighborhood is one of the poorest congressional district in the country (the 15th Congressional District of the South Bronx). It is also in a flood zone, and was heavily impacted by hurricane Sandy in 2012. It remains very vulnerable should another hurricane hit the city in the future. 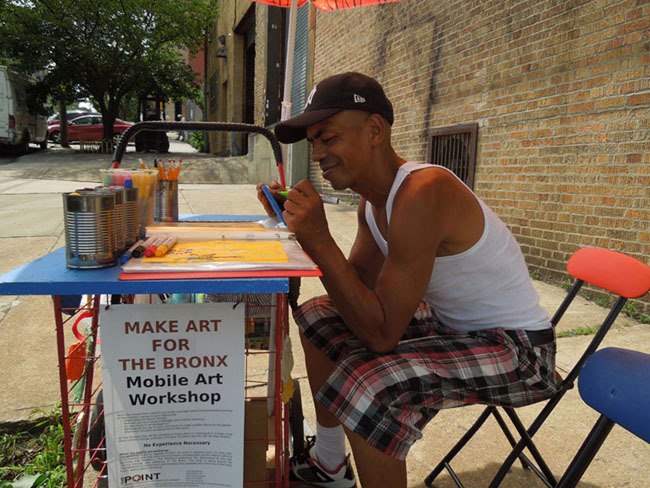 The residency's goal was to have artists do outreach in the neighborhood about resiliency, and find ways to connect with residents about climate change and pollution. My past installations had all involved the community which I like to engage in the art-making process. The biggest lesson I have learned from these projects however, is that the most vulnerable populations will not seek out art-making, and may not have the time and energy to think about creativity as part of their daily lives. So I went looking for them. 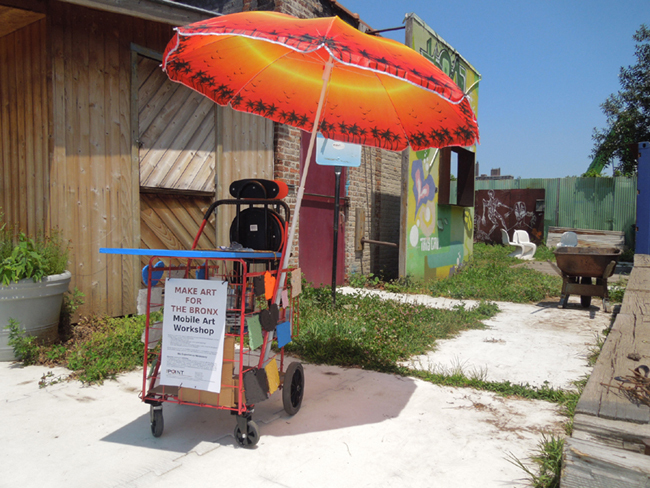 I made a mobile art workshop, which was essentially a shopping cart equipped with a table, an umbrella, two chairs, and art supplies that I rolled around the neighborhood. 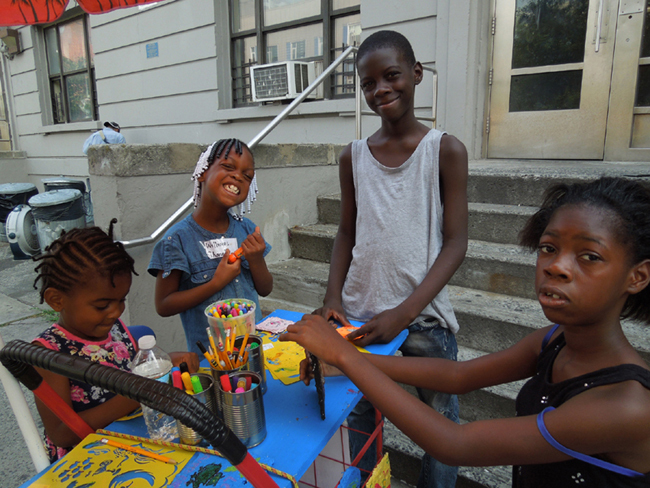 I stopped anyone who looked stationary, adults and children alike: people on their stoop, people sitting on public benches seeking cooler air, families waiting for their laundry to dry, and asked if they wanted to do artwork for the Bronx. After the usual quizzical look of amusement, I would explain that I had picked up street litter, made simple tiles out of the trash, and was going around asking residents to make artwork on the trash tiles, which would later be assembled on a mural. Essentially the idea was this: could we as a community turn negative experiences into something positive? The results were stunning. 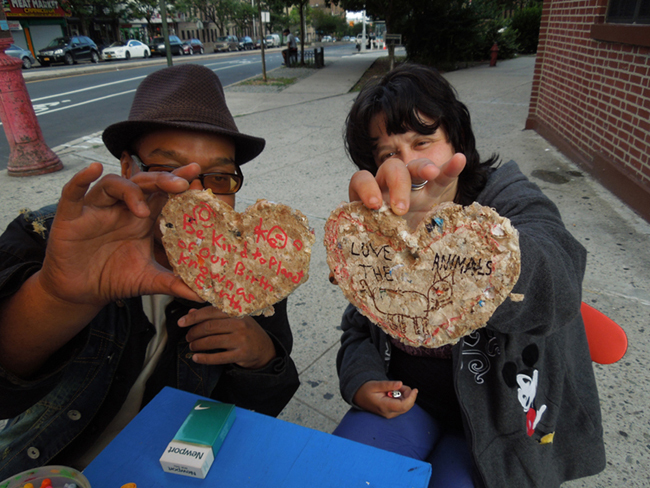 People sat with me and readily created artwork on the street, and told me their stories, which were most often heart-breaking. They created tiles about their lives, living in an urban environment, loving nature, and missing their home country. I hope that the experience has given a little bit of positivity and power to the participating artists, and that maybe, just maybe, it has given them a little bit of the happiness and peace of mind they deserve.